Wall St. Journal, Oct 21, 2014: A South Korean court for the first time has ruled in favor of a plaintiff claiming… thyroid cancer was caused by radiation from six nuclear power plants located [5 miles] from her house… “She has lived within 10 km of the plants for over 20 years and has thus been exposed to radiation for a long time. Other than the radiation from the nuclear reactors, there’s no clear reason for her cancer,” the court said… [A] government-commissioned study in 2011… showed women living within 5 km of nuclear plants had 2.5 times higher incidences of thyroid cancer… [In a study of the plaintiff's county by a] nuclear-power research institute… between July 2010 and December 2013, about 1.4%… were found to have thyroid cancer… in 2011 [women had] 114 cases out of 100,000 [0.11%]. Ken Buesseler, Reddit’s ‘Ask Me Anything‘, Nov. 10, 2014 at 8:30a ET: I’m Ken Buesseler, an oceanographer who studies marine radioactivity. I’ve been doing this since I was a graduate student, looking at plutonium in the Atlantic deposited from the atmospheric nuclear weapons testing that peaked in the early 1960’s. Then came Chernobyl in 1986, the year of my PhD… The triple disaster of the 2011 “Tohoku” earthquake, tsunami, and subsequent radiation releases at Fukushima Dai-ichi were unprecedented events for the ocean and society… the cooling waters and contaminated groundwater enter the ocean directly, and still can be measured to this day. 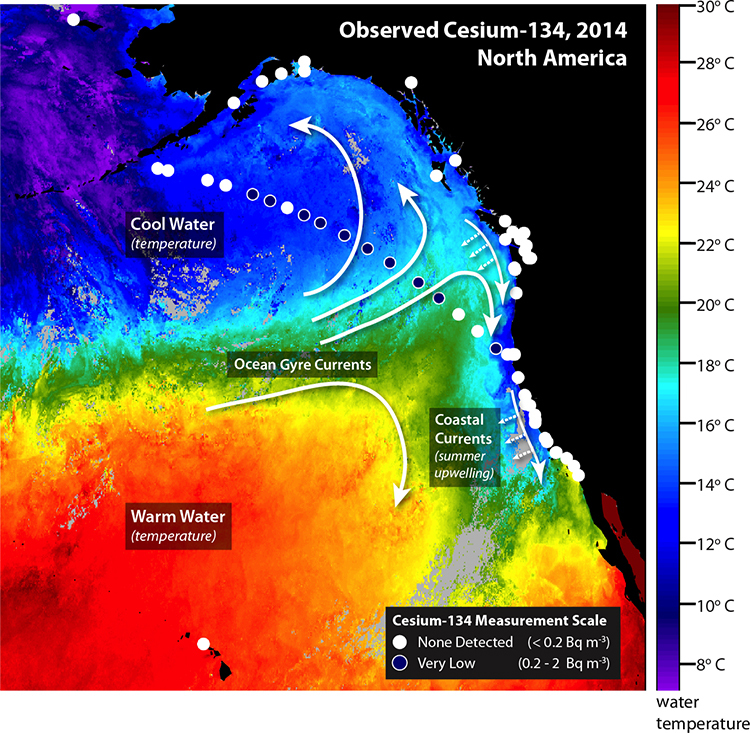 Across the Pacific, ocean currents carrying Fukushima cesium are predicted to be detectable along the west coast of North America by 2014 or 2015, and though models suggest at levels below those considered of human health concern, measurements are needed. That being said, in the US, no federal agency has taken on this task… new sampling efforts further offshore have confirmed the presence of small amounts of radioactivity from the 2011 Fukushima Dai-ichi Nuclear Power Plant 100 miles (150 km) due west of Eureka. What does that mean for our oceans?… I will be back at 1 pm EST (6 pm UTC, 10 AM PST) to answer your questions, Ask Me Anything! Despite a greater focus on nuclear terrorism as a top threat to international security, a new report tries to shed light on nuclear weapons materials that have gone missing – an area that has gotten very little scrutiny. The new report from the U.S. Army War College says international efforts, namely high-profile summits and official and unofficial workshops, have largely focused around how to prevent nuclear theft and sabotage with more countries agreeing to get rid of their weapons-grade nuclear fuels. But there has been "almost no attention" on incidences of material unaccounted for, known as MUF – namely, nuclear weapons-usable plutonium and highly enriched uranium. "U.S. nuclear weapons MUF alone is pegged at nearly six tons – i.e., enough to fashion at least 800 low-tech, multi-kiloton bombs," the report says. "Russian MUF figures are assumed easily to be as large. As for Chinese, Indian, Pakistani, Israeli, and North Korean MUF figures, though, we have only a general idea of what they might be." The report also says that civilian production of weapons-usable plutonium in the U.S., United Kingdom, Japan, France and India is also a concern. For example, losses of plutonium reprocessing and fuel making in the UK and Japan have been significant – "measured in scores of bombs worth. What they might be elsewhere, again, is unknown." While U.S. practices to account for nuclear material have improved since the Cold War, it doesn't answer the extent of such unaccounted material or how such losses can be prevented. "Without these answers, reducing or capping existing nuclear weapons arsenals and blocking future nuclear proliferation must remain iffy propositions," the report says. The report, which is divided into four parts written by several experts, provides more detailed information about some past MUF cases across the globe, U.S. government policies regarding nuclear nonproliferation and work by the International Atomic Energy Agency, among other issues. But scientists say there’s no need to panic. Scientists at the Woods Hole Oceanographic Institution on Monday said they had detected cesium 134—radioactive fallout from the 2011 Fukushima nuclear meltdown—about 100 miles offshore of the Northern California town of Eureka. “This Fukushima-derived cesium is far below where one might expect any measurable risk to human health or marine life, according to international health agencies,” the scientists said in a statement. The levels were 1,000 lower than the limits for drinking water set by the United States Environmental Protection Agency, they said. In an "Ask Me Anything" post on Reddit on Monday morning, Ken Buesseler, a Woods Hole marine scientist, said that if a person swam for six hours a day, 365 days a year, off Eureka, the radiation exposure would still be a thousand times less than what a person would be exposed to from a single dental X-Ray. Since the March 2011 earthquake and tsunami, the radiation dispersed from the Fukushima Dai-ichi nuclear power plant accident has been making its way across the Pacific Ocean. The power plant meltdown released unprecedented amounts of radioactive elements into the ocean, with cesium 134 traces in waters off Japan’s coast tens of millions of times higher than what Buesseler and his team have found here. “When cesium levels are in the 10’s millions, there are possible direct impacts on mortality and reproductive ability of marine life,” Buesseler said on Reddit. Those concerns prompted Japanese officials to close fisheries and impose some of the strictest radiation testing on food products in the world. In the U.S., scientists have been measuring Fukushima-influenced radioactivity in kelp forests off Southern California, fish caught from San Diego to Seattle, and Wood Hole has been monitoring water samples from Alaska to Mexico. Buesseler said the Eureka offshore sample was the only one that showed traces of cesium 134. So when do scientists expect the radiation to reach the West Coast? "We don't know exactly when the Fukushima isotopes will be detectable closer to shore because the mixing of offshore surface waters and coastal waters is hard to predict,” Buesseler said in a statement. While the detected levels are well below those deemed harmful to humans, models predicting how much radiation could be along the West Coast suggest cesium levels will increase over the next two to three years. Buesseler said careful and consistent monitoring of the water is needed to keep tabs on the radiation. “We need both citizen scientists to keep up the coastal monitoring network, but also research vessels and comprehensive studies offshore like this one, that are too expensive for the average citizen to support," he said. 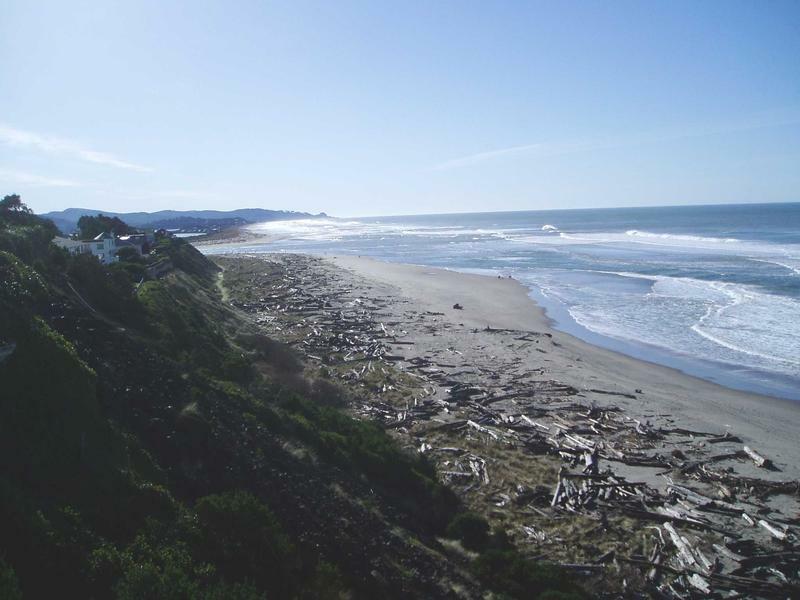 File photo of Oregon coast at Lincoln City. An oceanography institute announced Monday that trace amounts of radioactivity from Japan have been detected off the West Coast. Radiation experts say the low levels of radioactivity measured do not pose a health threat here. A post-earthquake tsunami in 2011 caused the Fukushima nuclear plant to spill a large amount of radioactive contamination into the Pacific. Oceanographers projected that it would take until this year for highly diluted traces to reach the West Coast of North America. In this illustration of ocean currents, white dots indicate where no cesium-134 was detected. Blue dots indicate locations were low levels of cesium-134 were detected farther offshore. A recent research cruise from Dutch Harbor, Alaska to Eureka, California detected the front edge of the plume multiple times between 100 and 1,000 miles offshore. "The levels offshore still are quite low,” said Ken Buesseler, a senior scientist at the Woods Hole Oceanographic Institution. “So by that I mean they are a couple units of these Becquerels per cubic meter — something that is about a thousand times less than a drinking water standard." Buesseler says he is reluctant to "trivialize" any amount of radiation, but says he personally has no concerns about swimming, boating or eating fish from local waters. Since the start of this year, Buesseler's lab has also tested about 50 seawater samples collected at the shore by concerned coastal residents from California to Alaska. All of those results have come up negative. This sampling was paid for through crowdfunding as part of an ongoing "citizen science" monitoring project initiated by Buesseler. A parallel but independent monitoring effort run through the radiation health lab at Oregon State University found no detectable traces of Fukushima radiation in seawater samples collected earlier this year in near shore waters along the Pacific Northwest coast. Scientists tracking the plume from Japan look for a short-lived cesium isotope, cesium-134, that serves as the "fingerprint" of Fukushima contamination. For context, radioecologist Delvan Neville at OSU said it helps to know that the cesium-134 levels reported by the Woods Hole researcher are "much less than the natural background radiation in seawater." In an interview, Neville was certain the low levels of Fukushima-derived isotopes detected in the northeastern Pacific do not pose an environmental or human health radiological threat. Buesseler is scheduled to present his findings Thursday during the annual meeting of the Society of Environmental Toxicology and Chemistry in Vancouver, Canada. The results Buesseler reported corroborate detections of cesium-134 in seawater far offshore from Vancouver Island starting last year. Scientists from Fisheries and Oceans Canada, Health Canada and the University of Victoria are collaborating on a monitoring effort that also includes fish sampling. None of the salmon, halibut, sablefish and spiny dogfish they have analyzed have contained detectable levels of radiation traceable to Fukushima. Monitoring efforts taken along the West Coast of the United States and Canada have revealed that radiation from the 2011 Fukushima Daiiachi nuclear power plant disaster is still washing in. However, don't let the media hype fool you. Experts are quick to add that the trace amounts of radiation discovered is completely harmless to humans. In fact, according to Ken Buesseler, a chemist from the Woods Hole Oceanographic Institution (WHOI), the telltale radioactive compound that was detected, called censium, was at concentrations more than 1,000 times lower than acceptable drinking water limits set by the US Environmental Protection Agency (EPA). "Most people don't realize that there was already cesium in Pacific waters prior to Fukushima, but only the cesium-137 isotope," Buesseler said in a statement. "Cesium-137 undergoes radioactive decay with a 30-year half-life and was introduced to the environment during atmospheric weapons testing in the 1950s and '60s. Along with cesium-137, we detected cesium-134 - which also does not occur naturally in the environment and has a half-life of just two years. Therefore the only source of this cesium-134 in the Pacific today is from Fukushima." According to the WHOI, thanks to their incredibly low concentrations (less than 2 Becquerels per cubic meter of water) it was actually very difficult to detect these compounds at all, which explains why the general public didn't hear about this sooner. "We don't know exactly when the Fukushima isotopes will be detectable closer to shore because the mixing of offshore surface waters and coastal waters is hard to predict," Buesseler added. "Mixing is hindered by coastal currents and near-shore upwelling of colder deep water." According to the chemist, the offshore radioactivity reported this week came from water samples collected and sent to Buesseler's lab for analysis in August by a group of "Our Radioactive Ocean" volunteers on the research vessel Point Sur sailing between Dutch Harbor, Alaska, and Eureka, California. This kind of crowd-sourced data has proven incredibly helpful for researchers, where federal agency monitoring alone has proven not enough for tracing this hard-to-find radiation. "The models predict [West Coast] cesium levels to increase over the next two to three years, but do a poor job describing how much more dilution will take place and where those waters will reach the shore line first," explained Buesseler. "So we need both citizen scientists to keep up the coastal monitoring network." Department of Fisheries and Oceans Canada (pdf), Oct. 22, 2014 (emphasis added): Arrival of Fukushima radioactivity in North American continental waters… The radioactivity plume was transported northeastward towards North America by the Kuroshio Current… Water samples were collected… in June of 2011, 2012 and 2013 and February, 2014 on a line (Line P) extending to a location (Sta. P26), approximately 1500 km west of Victoria, BC… [W]ater samples collected in June, 2012 at Sta. P26 detected 134Cs at levels indicating the presence of contamination from the Fukushima nuclear reactor accident. The 2013 results revealed the presence of 134Cs in the upper 100 m along the entire length of Line P indicating that the Fukushima signal had fully arrived in Canadian territorial waters. Levels of Fukushima 137Cs were about 1 Bq/m3 in June, 2013 which is equivalent to previous background levels of 137Cs from atmospheric fallout. These levels had increased to values of about 2 Bq/m3 by February, 2014. These 137Cs concentrations are significant, but are several orders of magnitude below those that would be considered a threat to the environment or human health. At 2:745 in – Buesseler: A paper that came out last year [shows] in a couple of years it’s actually going to be higher than its going to be on the front edge, kind of makes sense. But what’s really disturbing, and what concerns me, is when I saw this paper was there were no data to test this. At 44:45 in — Question: I’m wondering if there are other radionuclides that might not travel with the cesium. Maybe they’re just not as significant or not as many — but couldn’t there be other radionuclides, even if the cesium didn’t show up?… Buesseler: There are other isotopes that were released… What’s happening today off Japan… offshore, maybe 100 Bq/m3 of cesium, but the level of strontium-90 is almost the same… The ground waters that are a continued source tend to be enriched in strontium-90 [and] any number of isotopes including strontium-90… I would say the concern needs to move more towards strontium-90 and it is there at almost equal concentrations, it’s a bone-seeking isotope and therefore it stays in the fish for hundreds of days, not a couple of months, and in our systems as well… That is by far, to my mind, a much greater concern for new releases that will show up on our shores 3 years from now. Nuclear expert Arnie Gundersen, Fairewinds Energy Education: We have firsthand knowledge from at least a half dozen Japanese doctors… who have said they have been threatened… if they speak frankly to their patients about the health effects that they’re experiencing; or if they frankly speak in public about their fears — and, in fact, measurements — of how bad radioactive illnesses really are. So we know of at least a half a dozen doctors who are being ‘sat on’, and if 6 are, you can be certain that many more are as well. It’s a pressure that’s being applied up and down the spectrum… [You would now expect] exactly what we’re seeing — earlier cancers and thyroid nodules. Then over the next 15 to 20 years, increased organ cancers as well as muscular cancers… The fact of the matter is, we’re going to see cancers in that 4 to 30 year time span. And I still stand by what I’ve been saying now for 3 years. I think there will be a million extra cancers as a result of Fukushima Daiichi. Gundersen: For Asahi Shimbun, a major newspaper, to basically call on people to [move] back home based on the [claim there's no increase in birth defects]… is absolutely absurd. The number they’re not giving us is how many stillbirths and how many miscarriages there’s been in relation to the rest of Japan — and those are radiation-induced. You’ll get a stillbirth or you’ll get a miscarriage when a fetus is deformed or it is already developing cancer… The Japanese are not reporting stillbirths and miscarriages in Fukushima… That’s a much better indication… There are 35 million people in the Tokyo Metropolitan Area [and] their homes are contaminated… We had two women, sisters, both pregnant at the same time — one with twins, and one with a single baby. Two of the kids were stillbirths. The other was born with a deformity. They had the metallic taste in their mouth as the babies were in [the womb]. They lived in Tokyo, 130 miles from the accident. They’re people, they’re not statistics… and they’ve got no place to run…. no place to go.